Jejus (or Jejuma) are horses native to Jeju Special Self-Governing Province, Republic of Korea. There is a diverse array of types, each differently identified depending on their coat color. 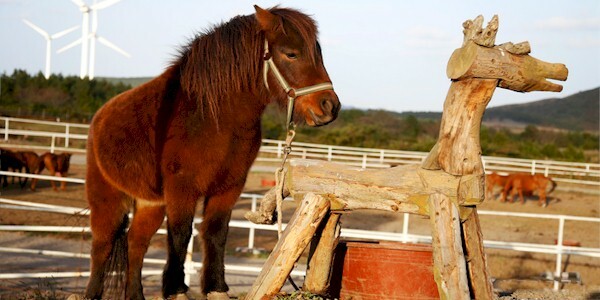 Jeju horses mature well in harsh conditions due to their strength and fitness. With an outstanding tolerance of low temperatures, they have been mostly pastured without the need for horse blankets or stables. They are small to medium-sized with a large head and a thick neck. They have a block-shaped body with a relatively long torso compared to its heights measured from the ground to withers or from the ground to its hip. They were traditionally used as farm and draft horses because of their remarkable stamina and endurance, while current breeds are utilized for racing and riding. With firm and thick hoofs, they run without the need for horseshoes. Stallions range from 121.8 to 128.9 centimetres (12.0 to 12.2 1/2 hands; 48 to 50 1/2 in), while mares usually stand between 113.2 to 127.3 centimetres (11.0 1/2 to 12.2 hands; 44 1/2 to 50 in) The typical lengths of both genders lie between 122.3 to 124.5 centimetres (48.1 to 49.0 in) and, on average, they weigh 230 to 330 kilograms (510 to 730 lb).